November 1st is World Vegan Day, the perfect time to ask ourselves the question: why do more and more people make the switch? Why do they go for a plant-based, cruelty-free lifestyle and avoid all animal foods (e.g. meat, dairy, eggs, honey), animal products (e.g. leather) and any products tested on animals (e.g. cosmetics)? 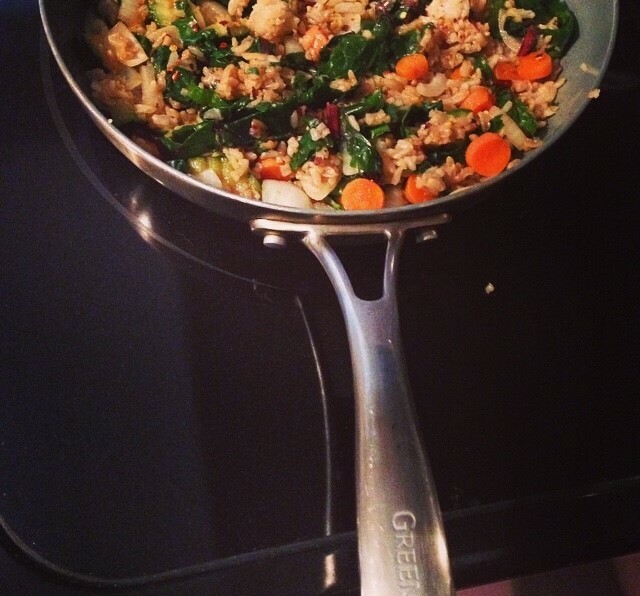 We asked Jessica, Marketing Executive in our GreenPan New York office, and die hard vegan this very question: “Why vegan? Because it’s healthier, greener, kinder to animals and to our planet’s future”, she said. And she sent us some snapshots of her day to share the love. Well, we LOVE the ‘kale’ sweatshirt and the ice cream, that’s a good start… What about you? I always start my day the same way, with a big glass of water and teaching or practicing yoga. Today I taught a 6am rise and shine class, but practiced a little before my students arrived. Fun fact: a “yogic” diet normally does not include meat, fish, poultry or eggs. So what came first, the vegan or the yogi? I never eat breakfast in one sitting, it’s always a few things throughout the morning. Today it was some bananas, apples and grapes. The eating started before teaching and continued throughout the morning. I’m never really done eating. Everyone in our NY office laughs and knows eating is one of my favorite things to do! They can always find me munching on something at my desk. After yoga, it’s time to get ready for work! It has taken a while to find products that work for me, but I am now the proud owner of a completely vegan beauty bag, from shampoo and perfume, to cosmetics and nail polish, like the color on my toes. I don’t always get dressed up for work, but when I do, I wear my vegan black suede dress, vegan red suede flats and of course, vegan leather bag! Sometimes I’ll grab a juice on the way to work as well when I don’t have time to make it fresh. *Please ignore my cluttered desk, sometimes work gets CRAZY! But let’s be honest, you can’t beat that view! Lunch time! Today is steamed veggies and brown rice. I know what you’re thinking- “where do you get your protein?” Broccoli has 11.1 grams of protein per 100 calories vs. beef that has 6.4 grams of protein per 100 calories. All good in that department! Every night after work, Lola (center) and I take a walk together. When he’s not working, Jon (my boyfriend) joins as well, like tonight. Jon and I LOVE animals and literally cannot visit the shelter or see a stray without adding to our clan! Lola, who I adopted 8 ½ years ago, pre-Jon, isn’t the only furry friend we share a home with. Charlie, who Jon rescued 6 ½ years ago, and Cole, who I rescued this summer, aka “the boys”, are the coolest cats with the biggest personalities! 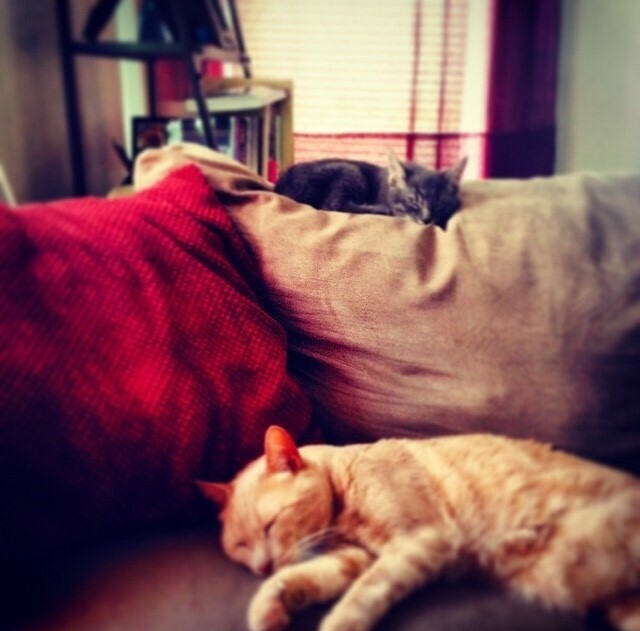 This is what Cole (grey) and Charlie (orange) looked like while we were out walking…cat napping away! When I have time, I try to get creative with dinner, like this mix of carrots, spinach, Swiss chard, onions, peppers and rice stir fry with soy sauce, and a kale and olive salad on the side. SO good! After a long day like today, it’s vegan ice cream and bad TV before bed. How cute is Lola waiting for me to share! Total coincidence, the t-shirt and shorts I’m wearing are “Free for All”, a brand put out by PETA (People for the Ethical Treatment of Animals). I always like to spend my money on a good cause!